Definitely no naked people here. Everyone is fully clothed, matter of fact. Don’t feel punked, this is still a mesmerizing installation by Mehmet Akten. I could probably spend hours playing around with a wall that color splashed and spluttered with every movement I made. It’s like finger painting with your entire body, but minus the mess. The installation was located in Newcastle, UK at the Tyneside Cinema as part of the Clicks or Mortar event. Here is a breakdown of the logistics of body paint wall. A software program (C++ written) analyzes real-time videos recorded by infra-red cameras. 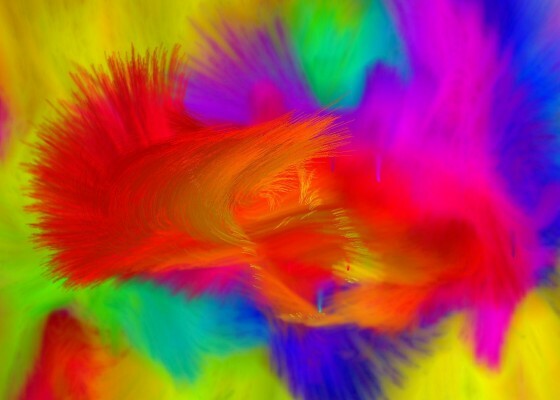 Different movements and actions create a plethora of assorted colors and brush-strokes. I would like to thankx for the efforts you have contributed in writing this blog. I am hoping the same top-quality blog post from you in the upcoming as well. In fact your creative writing skill has inspired me to start my own blog now. Really the blogging is spreading its wings rapidly. Your write up is a good example of it. For some reason only half of the post has been displayed, is it my browser or the site? Thanks so much for this! I havent been this moved by a blog post for a long period of time! You have got it, whatever that means in blogging. Anyway, You’re definitely somebody that has something to say that people need to hear. Keep up the great work. Keep on inspiring the people!